Pumpkin Pie for One Anyone? No this post is not about a single gal’s lonely Thanksgiving for one…and if I have just insulted you…I am sorry. Instead, this is one of those brilliant accidents. Although, it’s not quite as good as the accidental invention of Ivory soap, but it’s a great idea nonetheless. Let me back track a few steps. I am not making Thanksgiving dinner, but I am bringing a pumpkin pie, a chocolate pudding pie and the cranberry sauce. I had gotten my crusts out of the way and was up to my elbows in pumpkin puree, when something went awry. I put double the amount of cinnamon into the pumpkin filling. I know, it does not sound like that egregious of an error, but I am always a proud baker, and I don’t believe in serving anything short of taste perfection if I can help it. I tried to fish out some of the cinnamon, but to no avail. Before pouring the pie filling into my pie crust, I had a little taste just to check it out. I wouldn’t recommend this because it has three raw eggs in the batter so please don’t do it, but I took my life in my own hands and stuck a finger in and tasted it. To my disapproval, it tasted too cinnamon-y. Was it just my imagination? The only way to truly test the pie was to bake it, and take a little bite. But I am afraid a whole pie with a bite taken out is just not the kind of dessert show piece my mother was hoping for on her Thanksgiving table. I had a few scraps of pie dough left over after I had trimmed it for the pan, and I decided to make one tiny little pie so I could be sure that my pie was not only edible, but lived up to the pumpkin pie deliciousness that I am famous for in our family (or not so famous for…who knows). I rolled out a little circle of pie dough, just enough to squish into a mini muffin tin and poured a tablespoon of the filling into the pie crust. It cooked up in only about 20 minutes along side the big mama pumpkin pie. Look how lovely it turned out! It would be a nice, pretty little dessert to bring to a cocktail party. I know I am not the only person on the planet to have come up with a pumpkin pie tartlet, but the idea of a pre-Thanksgiving mini pie for the baker or chef on the night before Thanksgiving…that little gem is all mine. As I sat at my kitchen table, enjoying my four little bites of pumpkin pie tartlet with a little squirt of whipped cream on top, dusted with a tiny pinch of nutmeg, I thought about what a lovely idea this is. Us Thanksgiving bakers, cooks or chefs are frequently spread thin on the BIG DAY. Do you even remember eating what you made on Thanksgiving or are you just exhausted and glad everything is out on the table at the same time? It’s sort of like the food at your wedding. You spend all this time selecting the menu and then you don’t even remember eating it. But eating this teeny little pie all by myself, enjoying every slow delectable spicy bite—now that I’ll remember. By the way…it was totally delicious. Will I add an extra teaspoon of cinnamon next time? I don’t think so. I still imagined I tasted a touch too much cinnamon, but it was not enough to throw in the towel and start anew. I don’t think the guests will complain one iota. The crust, now that was over the top. I am sorry to tell you, but I am NEVER a humble baker so just get used to it if you plan on following this blog. The recipe is so ultra gourmet (sarcasm noted)…it is straight off the can of Libby’s, but it’s what I have used for the last twenty years or so and it has never done me wrong so I highly recommend it. 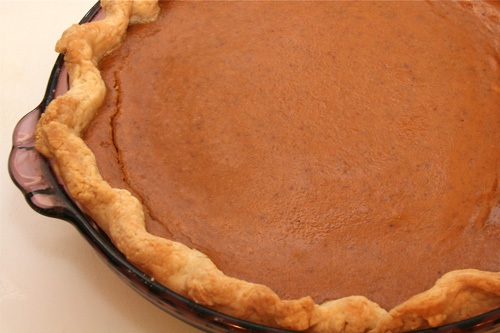 It’s absolutely the easiest pie you will ever make so go for it, dig in and bake a pumpkin pie from SCRATCH! You can do it! I have it on good authority that Trader Joe’s pie crust is totally divine so if sweating over homemade dough isn’t your thing then go for one of those if you have a Joe’s handy. Whatever you do, have a spectacular Thanksgiving and enjoy those around you..
For my Pie Crust Recipe, click the link and scroll to the bottom of my Lemon Meringue Pie post. 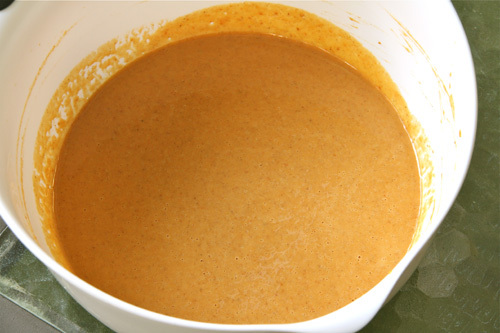 In a small mixing bowl, combine sugar through nutmeg. In a large bowl beat together eggs and pumpkin puree. 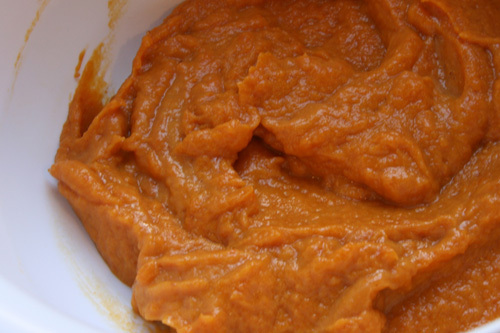 Add the dry ingredients to the pumpkin puree. Slowly add the can of evaporated milk and combine thoroughly. Pour into an unbaked pie shell and cover the edges with aluminum foil or use a pie edge cover like I did in a photo above. Bake at 425 for 15 minutes. Then turn the oven down to 350 and bake for an additional 30-40 minutes or until pie filling is firm. Cool completely before refrigerating. Top with whipped cream and a pinch of nutmeg. Happy Thanksgiving! 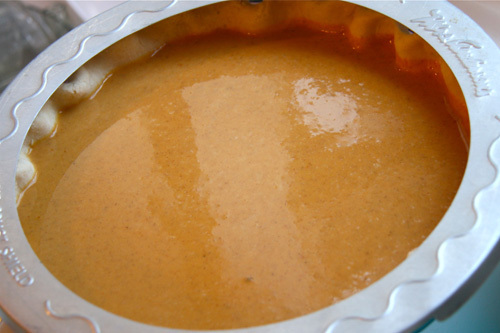 Categories: Pie, Pumpkin | Tags: Libby's pumpkin pie recipe, pumpkin pie | Permalink. I will and I will enjoy the big one tomorrow as well! You know, I never used to like pumpkin pie, but in the last year or two I’ve completely changed my mind. Its pretty fantastic. Happy Thanksgiving! This looks yummy as always!! So now that you have sampled them, what do you think? Yum! Such a cute idea. When I started making cheesecake, the recipe I had was for a 10-inch, and I had only had a 9-in pan…so I turned the extra into an individual cake. Better than the slice off the whole thing – I’d imagine your pumpkin tartlets are similar. Haha — I admire your dedication to making sure your pie turned out as perfect as possible. Hope you and your loved ones had a very happy Thanksgiving! Yes…I am totally willing to sacrifice for my craft. 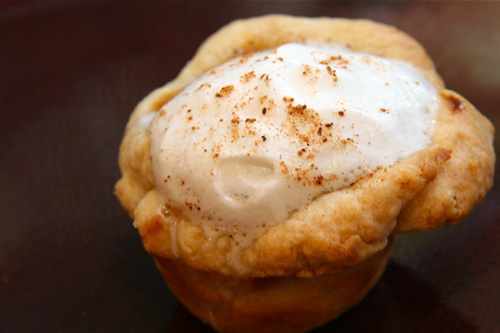 Okay that mini pumpkin pie tartlet is just too adorable! I could really go for one of those right about now… And I love the idea of the chef getting a little mini preview. Wishing you and your family a Happy Thanksgiving!! It is kind of adorable. I think I will bring some to a holiday party. That little tartlet is so beautiful! I love the idea of the baker’s “preview” tart the night before Thanksgiving. 🙂 I’m sure that everyone at the table loved the pie, it looks fabulous! It kept my portion size nice an small. 🙂 On Thanksgiving though, that was a different story. 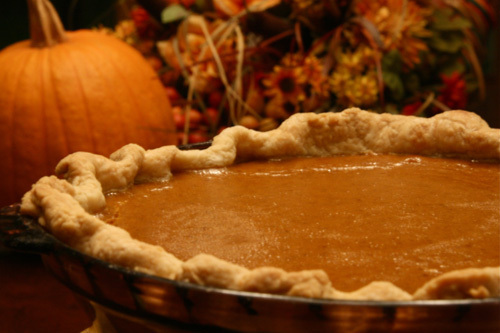 Pumpkin pie from scratch – now there’s an undertaking! I’ve always been fascinated with the whole process, and one year maybe I’ll try it out! Great job on that pie, and I’m just glad that you didn’t have to start over. I probably would have cried for a few minutes, put my apron back on, and got back to work! I definitely recommend it to anyone!